Norwegian Cruise Line is finding itself the target of a social media assault for refusing to reschedule a cruise for a family with a 5-year-old stricken by cancer. Norwegian says the family, which had declined travel insurance, canceled the trip within 14 days of departure, during the full 100 percent penalty period. The story appears to have first been published in a blog called Lil’ Mamas on July 23. The report states that Philip and Tara Colucci of North Babylon, N.Y., had booked a family vacation on a Norwegian cruise departing June 1. But on May 19, doctors found a cancerous tumor in son Nicolas’ liver. He had surgery and is undergoing chemo. “Of course, due to Nicolas being in chemo, they could no longer make those dates, so they contacted Norwegian, explained their circumstances and asked that they be able to reschedule. They weren’t looking for a refund. They still very much wanted to go on the trip. In fact, Nicolas has been using the idea of the trip as motivation to get better and even made a calendar where he is counting down the days, because he thinks they are going when he finishes his treatment,” the blog post said. The story, which attracted 235 comments as of today, encouraged followers to spread the word via social media. 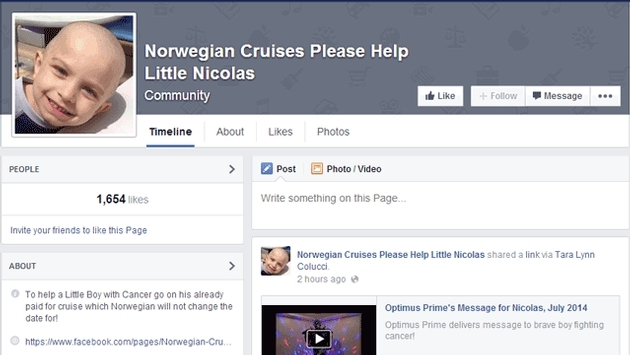 A Facebook page was started called “Norwegian Cruises Please Help Little Nicolas.” The story was spread by Jim Walker, a Florida attorney with the website Cruise Law News. And then it began to appear on mainstream news, including a Fox News report and a Long Island TV station. Most comments and reactions criticize Norwegian for not bending the rules to accommodate the family. Said another: “Apparently there is no compassion in business anymore, it’s only about money and the ease of obtaining it. This mother is asking for nothing more than to reschedule, it’s like moving an appointment at a hair salon or changing a doctor appt. Sure there’s more money involved, but who, pray tell, is really affected by the change of dates? Why is it so hard? And why isn’t there an extenuating circumstance clause in the sales contract WITHOUT purchasing insurance? Norwegian did have some defenders. 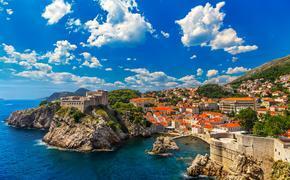 “Sorry, but the family was offered the opportunity to purchase travel insurance and declined. Instead, they gambled $4K+ on the fact that they would be able to go in order to save at most a few hundred dollars for insurance. If they had gambled $4K in a casino and lost, would they expect a refund there too? I feel bad for the family and the child, but to go public with this in an attempt to extort NCL for the amount of the refund is just wrong. Norwegian sent a statement to Travel Pulse that reads: "After learning of the circumstances regarding the cancellation of the Colucci family’s cruise, we wanted to make sure that Nicholas would be able to take cruise that he was so very much looking forward to. While we knew getting Nicholas well again was the family’s top priority, we offered to work closely with the family when Nicholas was ready to travel to ensure that they took their vacation and we provided a personal contact at Norwegian for the family to stay in touch with. Separately, one of our travel partners reached out to Mrs. Colucci and offered their help in making sure the family took the cruise they had planned. "In addition, we contacted the Make-A-Wish Foundation, an organization that we work closely with to grant the wishes of hundreds of children each year who want to take a cruise. If the family chooses to participate in the Make-A-Wish program, we will make sure that they receive the cruise they were looking forward to. "We are touched by many similar situations and do our very best to work with our guests to offer support wherever possible. As a company that provides vacation experiences for more than 1.3 million people each year, we understand that situations such as this occur. In all instances, we must balance these requests with the need to treat fairly those guests who have elected to purchase travel protection insurance. In an effort to provide guests with peace of mind, we offer travel protection and we strongly encourage our guests to take advantage of this safeguard to cover unforeseen circumstances. We continue to wish the very best for the Colucci family and hope that Nicholas gets well soon so that he can take his long-awaited cruise." At least one person tweeted that the anonymous company was Celebrity Cruises. Philip Colucci also did not reveal the name of the cruise line when asked on his Facebook page — but on July 25, he “liked” the official Facebook page of Celebrity Cruises.